This new image from the MPG/ESO 2.2-metre telescope at ESO’s La Silla Observatory in Chile shows a contrasting pair of galaxies: NGC 1316, and its smaller companion NGC 1317 (right). An observatory in Chile has caught sight of a cosmic killer: a galaxy that has destroyed at least one of its galactic neighbors. 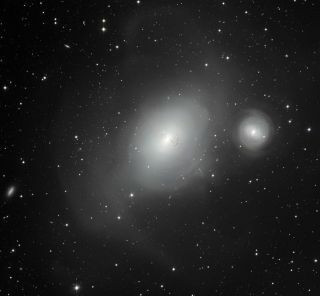 One of the brightest sources of radio emission in the sky, the giant elliptical galaxy NGC 1316 shows evidence of its violent past in a composite of images released today (April 2) by the European Southern Observatory. The galaxy is located about 60 million light-years from Earth, according to ESO. You can watch a video flythrough of the galaxy produced by ESO, which described NGC 1316 as a cosmic "serial killer" in an image description. Astronomers created the composite — taken by ESO's La Silla Observatory — to search for insights into the faint features of NGC 1316. The unusual dust lanes at the galaxy's center stand out, as do a population of unusually small globular star clusters. Together, these two features hint at the idea that NGC 1316 swallowed a dust-rich spiral galaxy approximately 3 billion years ago. Faint tidal tails are also visible in the image, the wisps and shells of stars ripped from their original location and flung out into space. Such tails result from the complex gravitational effects on stellar orbits that occur when two galaxies come too close together. "All of these signs point to a violent past during which NGC 1316 annexed other galaxies and suggest that the disruptive behaviour is continuing," ESO officials said in a statement. The supermassive black hole at the heart of the galaxy has well profited from its destructive path. As material from consumed galaxies falls into the black hole, the black hole brightens, making NGC 1316 the brightest radio object in the southern constellation of Fornax (the Furnace) and the fourth brightest radio source in the entire sky. The picture, which also shows the smaller spiral galaxy NGC 1317, provides insight into the universe beyond the pair as well, with a particularly dense concentration of distant galaxies to the left of NGC 1316. The individual images were taken by La Silla's MPG/ESO 2.2-meter telescope.